Editor’s Note: This post is part of a student blogging series on The Business Of Sports & Sustainability. Students attend the Presidio Graduate School which offers the only MBA-level sustainability program focused exclusively on the sports industry. You can follow the series here. Big-name sports teams in baseball, basketball, football and hockey are warming up to the idea of installing LED (light-emitting diode) technology in their stadiums to improve performance and save on electricity costs. 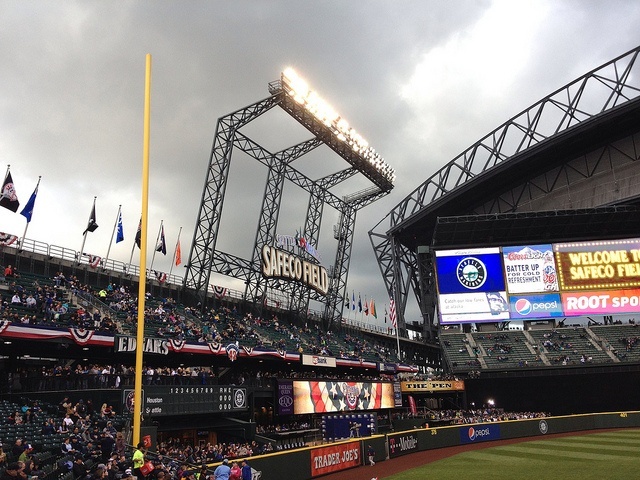 This winter, the Seattle Mariners became the first Major League Baseball team to illuminate its field of play with LED technology, replacing existing metal halide lamps at Safeco field with LED lamp fixtures that last 30 times longer and reduce lighting costs by at least 60 percent. These more efficient LED lights reduce power usage by 784,000 kilowatt-hours each year, saving more than $50,000 in energy costs. In addition, the reduction in energy use equates to greenhouse gas savings that will help advance the team’s environmental commitments. Joe Garagiola, Jr., senior vice president of standards and on-field operations for Major League Baseball, gave his stamp of approval to the technology, saying: "Thus far, our experience has indicated that the Mariners’ new LED technology at Safeco Field will be better for our players, fans in the ballpark and viewers watching at home. We applaud the Mariners for an innovative step that promises to improve efficiency and the fan experience in numerous ways, all while serving as a welcome addition to our overall greening efforts." Less than a year ago, sports teams were hesitant to adopt LED lighting for fear of negative reception to how colors would display on broadcast television and because of the larger upfront capital cost. However, more team managers and broadcasters have become convinced that LED tech provides superior lighting performance for players and spectators through more uniform field lighting, as well as reduced glare and shadows in-person and on television. Players prefer LED light, too, as it more closely imitates sunlight. On the color rendering index (CRI), sunlight scores 100; LED scores 81; and traditional metal halide scores 63. The upfront capital cost premium of LEDs can also be regularly offset by annual maintenance cost reductions, which can save up to $100,000 or more in large stadiums. Plenty of opportunity still exists for the thousands of sports facilities in the U.S. that have yet to upgrade to LEDs. Expect more stadiums and venues to switch to LED lights as the good news spreads. Check out these must-reads for more information on the success of the LED lighting technology in sports. Vincent is a resource conservation specialist in waste and energy. He previously worked as a recycling coordinator in Contra Costa County, CA and is a former Environmental Defense Fund Climate Corps Fellow. Vincent is a MBA Candidate in Sustainable Management at Presidio Graduate School in San Francisco. This “micro-blog” is the product of the nations first MBA/MPA certificate program dedicated to sustainability in the sports industry. Led by Dr. Allen Hershkowitz, Senior Scientist at NRDC, The Business of Sports and Sustainability certificate is housed at Presidio Graduate School, the nation’s top sustainable MBA program. Posts explore the connection of sustainability with operations, branding and fan engagement of the sports industry including leagues, teams, venues, sponsors, vendors and surrounding communities.